This recipe may have just made all your dreams come true!! Not only is this Mac & Cheeze delicious…but all of its deliciousness is derived from plant power!! It is dairy free, AND virtually fat-free!! I actually blew myself away with this recipe. I was so thrilled when I realized that the cheese sauce did not need any added nuts!! Most vegan cheese sauces are SO high in fat, and to me, that just makes the whole experience unpleasant. This mac & cheese gets its creamy deliciousness from the almighty Yam – an excellent source of plant-powered starch. (The BEST starch in my opinion…im literally addicted to sweet taters / yams, whatever you want to call them!) Speaking of healthy starches, if you haven’t read The Starch Solution, then I highly recommend it!! It will change your life! I have this recipe served with glazed brussel sprouts; that recipe will be coming up next week!! This recipe is the new favorite in our home!! I hope you love it as much as we do!! Add all sauce ingredients to a high powered blender and blend on high until smooth and warm. Pour sauce over cooked penne pasta. 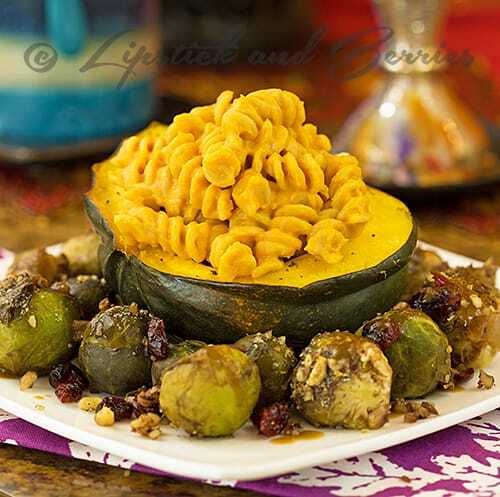 Serve in acorn squash halves. This sounds fantastic! I’ve already tried Katie Mae’s recipe for mac and cheese but am really looking forward to trying this too! Hi Mia!!! Awww I love Katie Mae! I hope you enjoy this recipe too 🙂 XOXO!